How does our price match policy work? There's nothing to it. 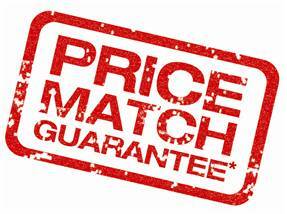 If you find the same fire or fireplace cheaper elsewhere then contact us and we will do our best to beat or meet the competitor's price. The price matched item must be identical, including model number, components and warranty. It must be in stock and available for purchase at that price from an authorised UK based company. Additionally, the price matched must like for like, and as such delivery charges will need to be included where applicable. Please ask for details.